Just like creating an elaborate wedding cake, the construction of a green roof has many different layers all of which are crucial to a stunning finished product. 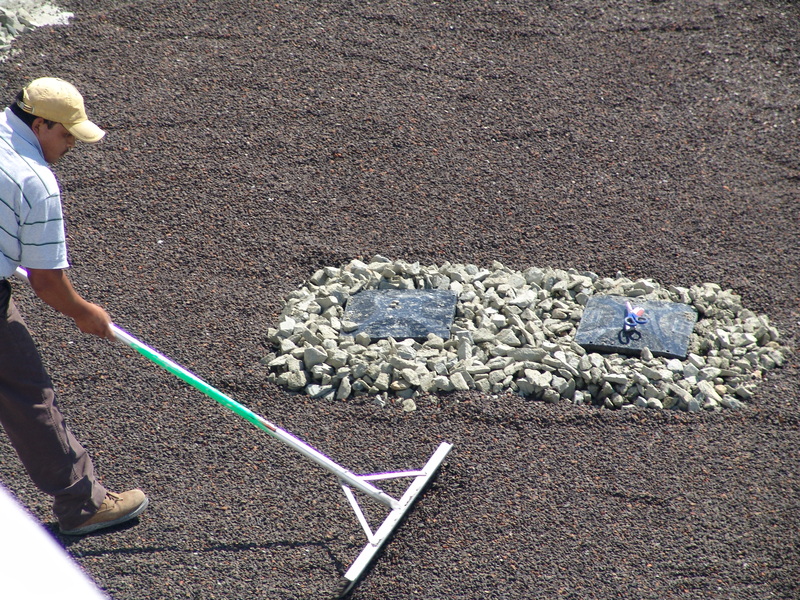 For the past three days, the Furbish company has been creating the precise layers of the Kemp Hall green roof. Like most great bakers, the beneficiaries of their finished product are not aware of the process. 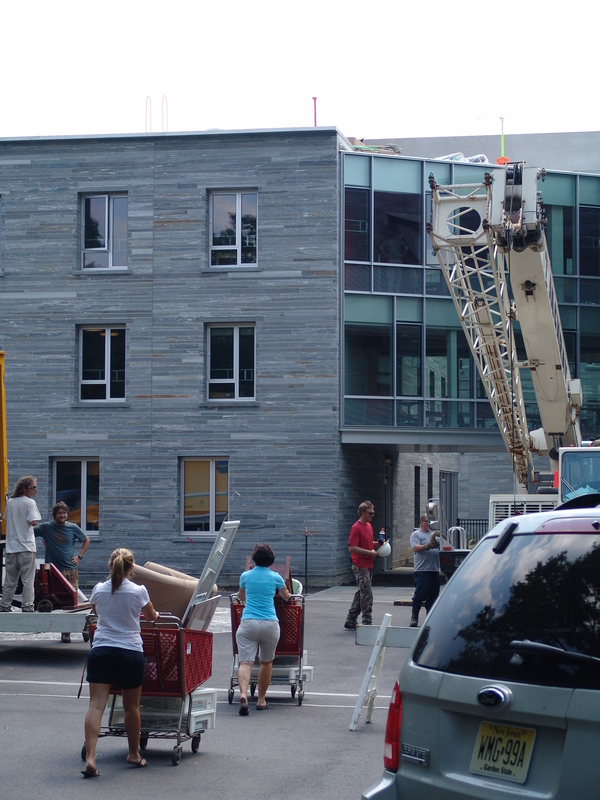 While the massive crane lifts supplies onto the roof of Kemp Hall, a small number of unknowing students are moving into their new home for the year, unaware of the sustainable and attractive roof they will soon enjoy viewing from their third floor lobby. As described in the post earlier this week, a solid bottom layer is key to any layering project. With the two small leaks found by International Leak Detection successfully repaired, the second layer of the Kemp Hall green roof “cake” can be applied. 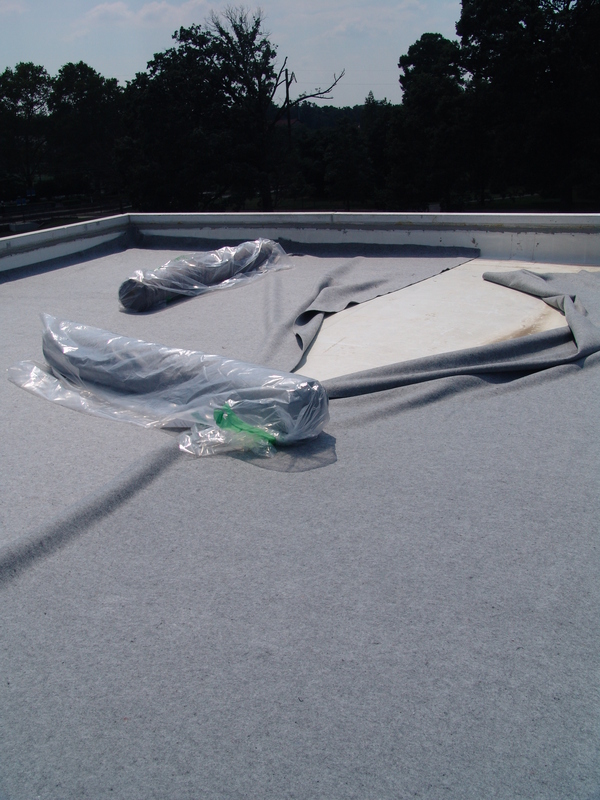 This layer of protection fabric is rolled on top of the roof to shield the roof membrane and provide greater water retention. After the initial layer of protection fabric, a strip of coarse ballast stone is placed along the perimeter of the roof. 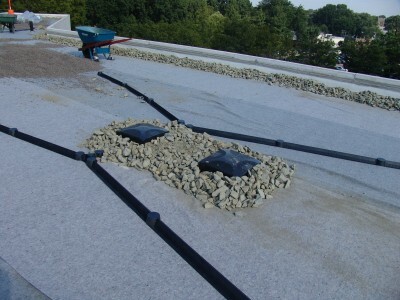 These ballast stones serve as a buffer zone between the growing media with plants and edge of the roof. 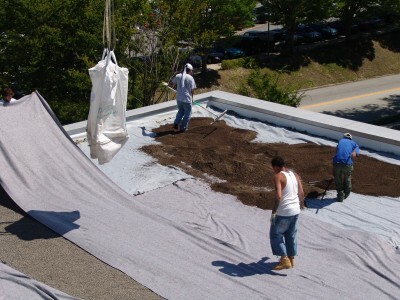 They prevent soil from splashing over the edge during heavy storms, create a positive drainage flow to the center of the roof, and provide a level of protection for the plants and growing media against the wind. On this same layer, plastic drain boxes and channels are placed over existing roof drains. Drain boxes and channels protect the drains from being clogged with debris and help maintain a clear path to and around the drains. These boxes can also be opened and cleaned for maintenance as well as stacked several layers high depending on the thickness of the growing media on each roof. The third layer consists of the appropriately titled drainage layer. This layer is much lighter and finer textured than the ballast stone found around the perimeter of the roof. 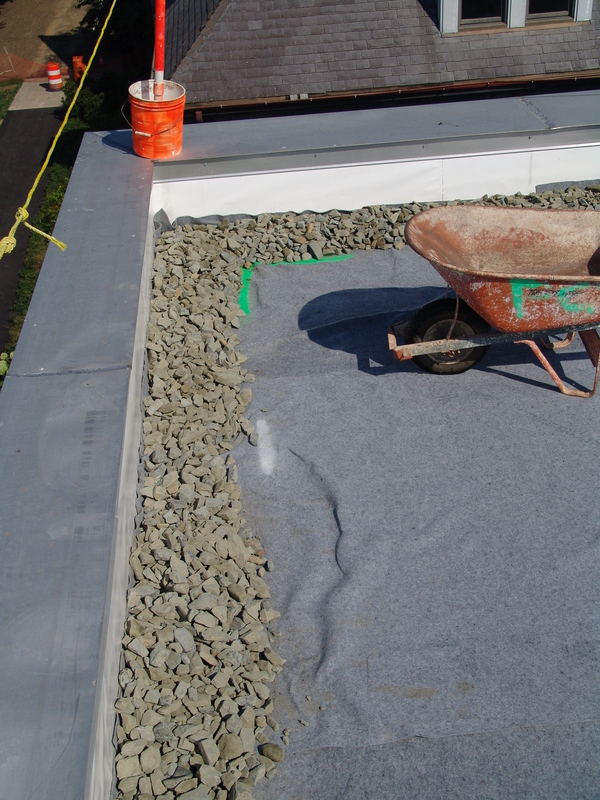 This layer of heat-expanded shale called Solite® was donated by the same Swarthmore College graduate-owned company who provided the growing media for the Alice Paul green roof. The Solite® layer helps drainage and provides an additional area for roots to grow into. The fourth layer is like the icing found on any layer cake: it is a repeat of the first layer of icing. This second layer of fabric is slightly thinner than the first layer and is designed to work as a filter. The main task of this layer of “icing” is to prevent fine particles of the growing media from migrating into the drainage layer below. Next, the growing media is placed on the roof. This product from RoofliteTM was lifted onto the roof in large super sacks and is engineered for extensive roofs. 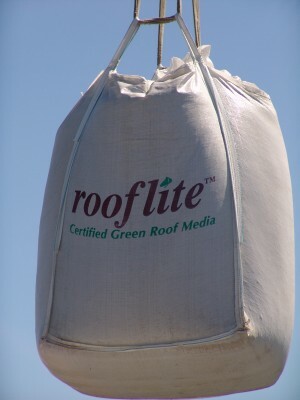 The growing media is heavy enough to not be dislocated by wind or flowing water, stable to give plants sufficient hold, should not shrink or become too compacted, is resistant to frost and fire, retains rain water, drains excessive water, and provides the right amount of nutrients for the plants. 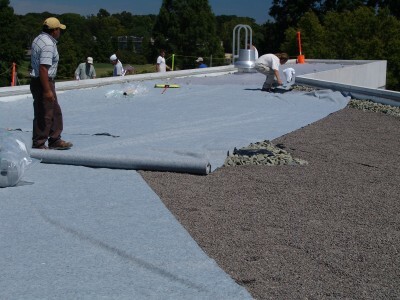 The RoofliteTM layer is spread evenly at 2 inches thick throughout the roof. In the semi-intensive areas of the roof, a layer of eight to ten inches thick is created. The final layer of the green roof and the decorative topping of this cake are the plants. We will not be planting the Kemp Hall roof until mid-September when it is cooler for plants to become established. Keep checking the blog to learn how and what we will plant on Kemp Hall. Most pleasurable and informative to see and read. I am translating a piece on “green roofs” and this was the first time that I have come across this kind of vocabulary. Thank you very much! Thanks for sharing all of the pictures taken during the whole process! I am a freshman in college, and for my Communications class, I’ve decided to give a speech on green roofs. This really helped me to understand the process of building eco roofs much more than the many diagrams that I’ve seen.